A new phenomenon on Twitter is further blurring the lines between real and fake news. 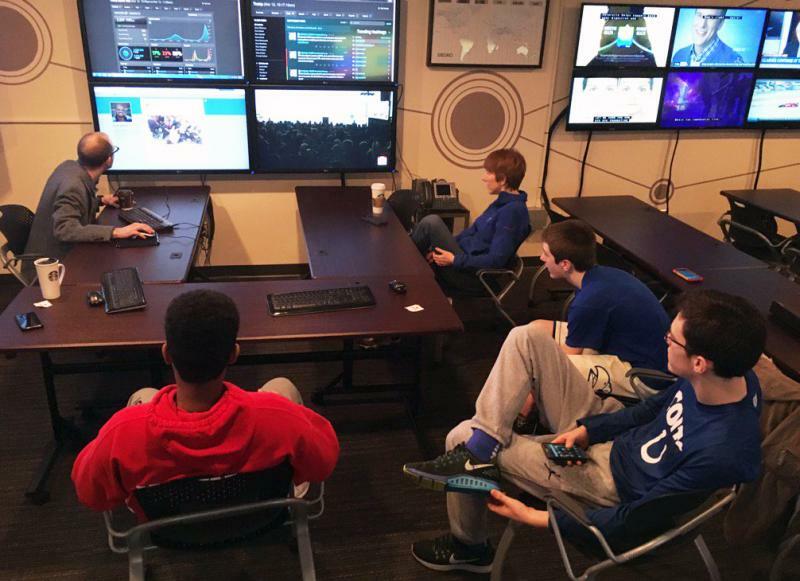 Illinois State University's School of Communication SMACC is tracking around 80 different so called "alt" or "rogue" Twitter accounts. 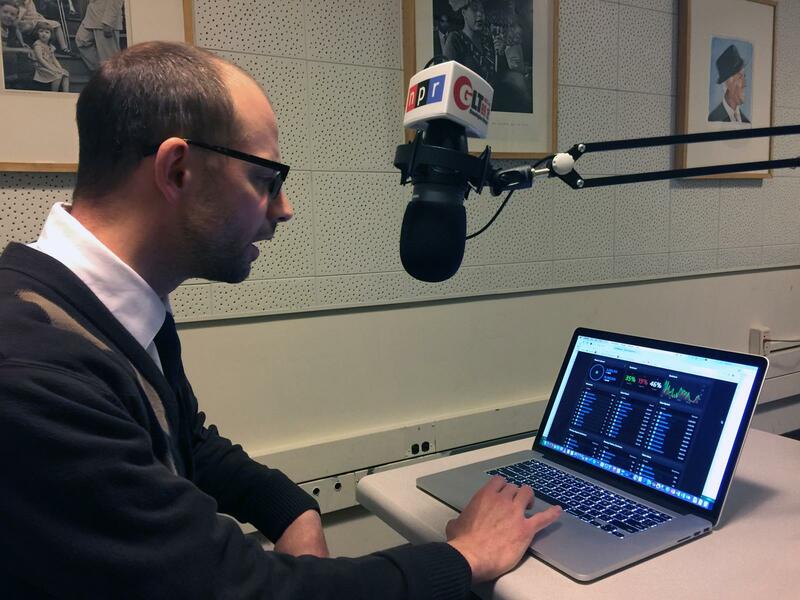 Nate Carpenter is the assistant director of media convergence and runs the SMACC lab. While the so-called rogue accounts may provide factual information, Carpenter said to "pay attention to the message" to judge the reliability of the Tweets. One of the first alt accounts created was @BadHombreNPS. It's the rogue version of @BandlandsNPS, the official account of Bandlands National Park. According to the Snopes fact checking site, the official Badlands account Tweeted about climate change, and those Tweets were quickly deleted. The Badland Tweets and deletions occurred just days after the National Park Service official Twitter account was deactivated after posting unflattering tweets about President Donald Trump on Jan. 20. The Trump administration also called for a social media blackout of the Environmental Protection Agency. The EPA's official Twitter account has been silent since Jan. 19. Many subsequent accounts created shortly after the @BadHombreNPS account were also sites associated with science and climate change, such as @RogueNASA and @ActualEPAFacts. "Accounts like this are designed to inform. That's the initial idea behind many these is to continue that flow, that stream of science," said Carpenter. "The next layer we'll see happen is they want to invoke outrage. So, they'll post things that would otherwise be very disturbing. As soon as those kinds of posts start to happen that's when I start to say there may be some distortion put in place." 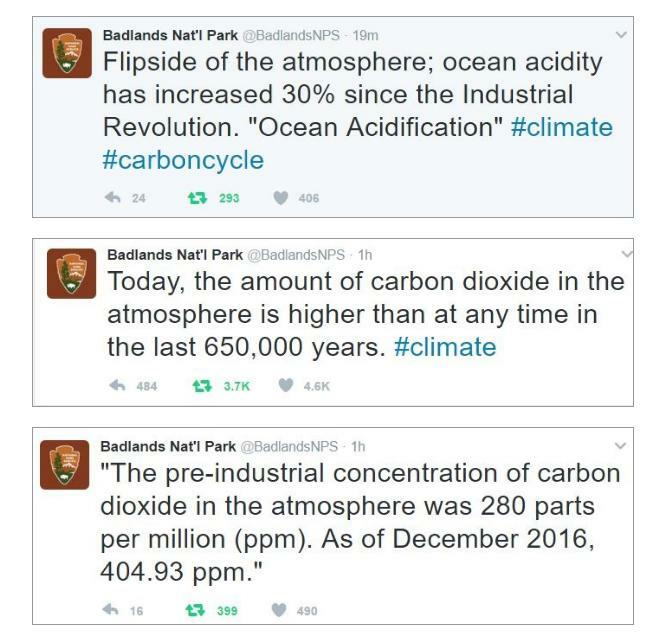 Tweets deleted from the official Badlands National Park account. If the so-called real accounts are being gagged or restricted, the Tweeted information isn't necessarily less reliable, but the accounts may post more innocuous information. Carpenter said many of the alt or rogue accounts have also evolved, moving toward resistance type Tweets. Carpenter and the SMACC are also following some purely political accounts such as @RoguePOTUSStaff. "What's hard to determine with that one is who exactly is producing it," said Carpenter. "There are so many theories that emerge. We start to fall into the land of conspiracy theory because there are people who go in an analyze all of the text and say this account may be coming from Russia, based on how certain words are abbreviated." He said the intense scrutiny of rogue accounts is a result of the high level of distrust of any information. Carpenter also said it's obvious to him that multiple people are managing some of the individual alt accounts. "Some of these rogue accounts I've been following, I can go back through and see when they've been passed over different hands. There will be abrupt shifts in style or devices used," said Carpenter. Carpenter said he's never seen accounts grow so quickly -- go viral -- as some of the rogue accounts. @ActualEPAFacts has 261,000 followers. "Truth and reality is something that's being fought over right now, " said Carpenter. 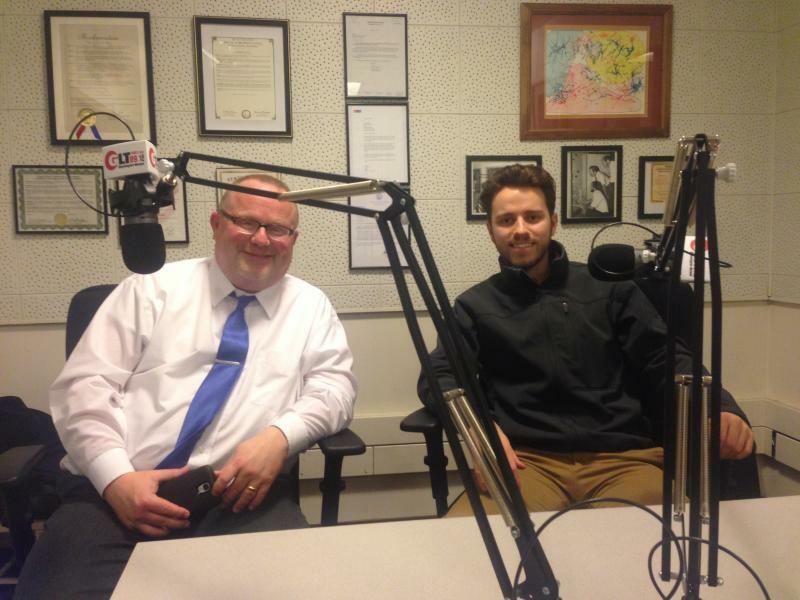 Hear the full Sound Ideas interview with ISU's Nate Carpenter. While GOP Presidential Candidate Donald Trump was addressing more than 2,000 people at a hangar at the Central Illinois Regional Airport, a small group of Illinois State University faculty and students were watching the Trump rally go viral. Super Bowl week activities took a backseat, at least for several hours, to a previously-unknown Illinois State University football recruit who dominated social media for more than a day. 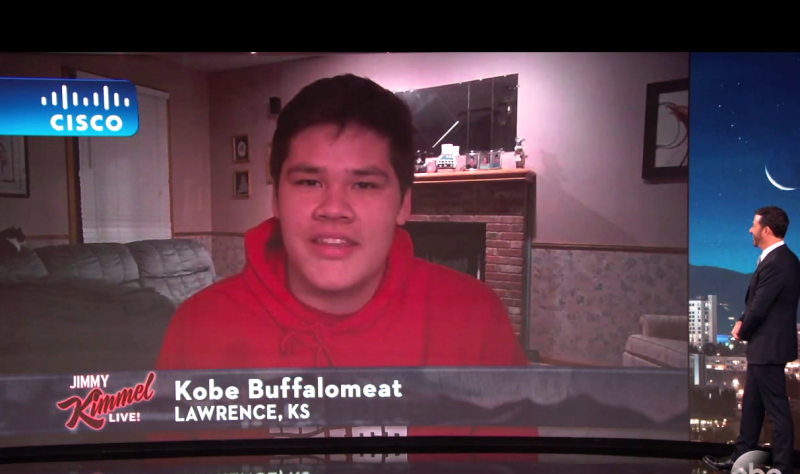 Kansas high school football player Kobe Buffalomeat literally made headlines when his decision to play at ISU was made public during national college signing day, February 1st. His unique handle was highlighted online and otherwise by Sports Illustrated, ESPN, Washington Post, New York Times and other media outlets.